Eiisha Morgan Mansion. Monthly Meeting Location. The Fairfield Historical Society meets every first Tuesday of the month between March and November. We meet at the Elisha Morgan Mansion. It is located on Ross Road in Fairfield, OH. Every month the members and guests have inspiring speakers and present many great historical facts about Fairfield and the surrounding communities. They talk about the History of Fairfield and how it relates to the present day. Please come and join us for our monthly meetings. 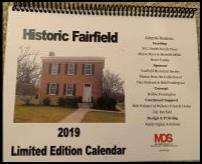 Calendars can be picked up at Fairfield Community Art Center. Note: All meetings at the Elisha Morgan Mansion @ 7 PM on Ross Road in Fairfield unless noted otherwise. Any questions More comments please send us an email. 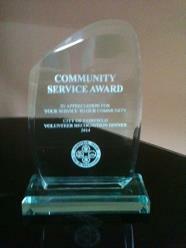 The City of Fairfield recognized The Fairfield Historical Society with the Community Service Award (above) for their many efforts to Collect, compile, and promote our history.